It's a meeting of the 'H's' this week as Harrod Horticultural comes to Hoveton Hall with the new Garden Arch range the catalyst for the get together! Intrepid Harrod Horticultural photographer and horticulturist Martin Fiddes was given the brief to locate a public venue in the area suitable for displaying the new garden arch range as well as being open to visitors so they could examine the structures at close range and literally feel the build quality! Martin compiled a shortlist and after visiting a number of gardens he sent his dossier of findings to New Product Manager and Arch range developer Alex Rocke who, with the help of designer Lee Desborough, decided that Hoveton Hall was the ultimate setting in which to install and show off the structures in their full glory. 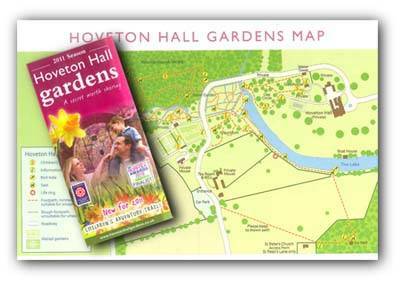 The gardens of the Hoveton Hall - situated just outside the 'Capital of the Broads' at Wroxham near Norwich - are a popular tourist attraction in the area and well worth a visit - and if you're there around the 11th and 12th of August, you might spot the Harrod installation team hard at work assembling and erecting the arches! We'll keep you up to date on our progress and of course, the images we shoot will appear in both our catalogues and online. We'll also put up a gallery of images on our Facebook page but if you're on holiday on the Broads this summer, we fully recommend you moor up at Wroxham and come and see the arch range for yourself!